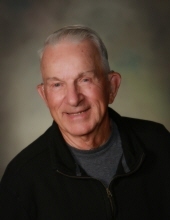 Richard P. Deutschman, 83, of Portage, Ohio passed away Wednesday March 20, 2019. He was born September 14, 1935 in Portage to the late Alfred and Martha (Smith) Deutschman. He married Eleanor M. Hillard on October 30, 1955 and after 49 years of marriage she preceded him in death on March 26, 2005. Richard was a 1953 graduate of Bowling Green High School. In the early years of his marriage he farmed and worked for Urshels Machine Shop in Bowling Green. He then went on to work as a tool and die maker for the Chevrolet GM Transmission Plant for 46 years, retiring in July 2001. He was a member of Christ Unite Methodist Church in Portage where he served many years as head usher and communion steward. He and Eleanor loved to travel. When their children were young they took several trips across the United States and to the cabin his father built on Manitoulan Island in Canada. After the children had grown, they enjoyed traveling, taking a trip to Oberammergau, Germany in 2000 and several cruises to the Caribbean, Panama and Alaska. Richard was a loving and generous father and grandfather. He was a frequent visitor to McDonalds for breakfast and conversation, loved playing cards and having lunch at the Wood County Senior Center and kept in touch with his high school classmates with monthly lunches at the Bowling Green Country Club. Together, he and Eleanor raised three children who survive Mark (Nydia) Deutschman of Round Hill, Virginia, Vicki (Brian) Cramer of Portage, Ohio and Gary (Connie) Deutschman of Portage, Ohio. He is also survived by his grandchildren Amanda Deutschman of Roundhill, Virginia, Dorothy Deutschman of Ashburn, Virginia, Andrew Cramer of Portage, Aaron Cramer of Brownstown Twp, Michigan, Nathan, Lauren and Anna Deutschman all of Portage, step-grandchildren Hector Quetel of Leesburg, Virginia, Tiffany (Cory) McCain of Roundhill, Virginia and siblings Ernie Deutschman of Toledo, Ohio and Mary Ann Franks of Findlay, Ohio. Along with his wife Eleanor, Richard was preceded in death by his parents Al and Martha, siblings Lillian Bowers Burkhardt, Al Deutschman and Louis Deutschman and one grandson Donald K. Turrell III. His funeral service will be held on Saturday March 23, 2019 at 1:00 p.m. at Christ United Methodist Church, 301 W. Main Portage, Ohio 43451. Rev. Maurice Dunn will officiate. Interment will follow at Portage Cemetery. Visitation will be held Saturday at the church from 11:30 a.m. until the time of the service at 1:00 p.m. Funeral arrangements have been entrusted to Dunn Funeral Home in Bowling Green. Memorial contributions may be given to Christ United Methodist Church, Bridge Hospice or The Wood County Senior Center. To send flowers or a remembrance gift to the family of Richard Deutschman, please visit our Tribute Store. "Email Address" would like to share the life celebration of Richard Deutschman. Click on the "link" to go to share a favorite memory or leave a condolence message for the family.